Julie's Creative Lifestyle: New Magazine Change! Hi Friends! I'm a little disappointed because my favorite crochet magazine called Crochet Today is no longer being published! 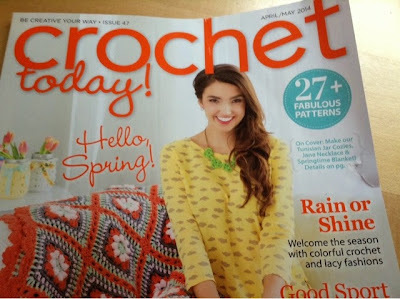 I loved this magazine and they had such pretty crochet patterns to offer each month. Instead they gave me a new magazine to try out for the remainder of my subscription. The new magazine is called Mollie Makes. Mollie Makes is a UK magazine but they are now making a US Edition. Even though I'm a little upset and disappointed I have looked through this magazine and they do have all sorts of crafts to offer and a little bit of crochet. I did enjoy looking through this magazine and I even recognized one of the contributors Kim Layton from her blog Everything Etsy and to see her lovely blog you can click here. I guess everything changes for a reason and I know there are plenty of crochet patterns available online but it was just fun to look through a magazine that I enjoyed. I am over it and guess I'll have to find a new crochet magazine to totally love! Has this ever happened to you where you love something and then they discontinue it or change it completely? Wishing you all a nice weekend and see you all here next week for Makeup Monday. It's nice that they offered an alternative, I imagine most places don't, but big boo to the one you love going out of circulation. So sorry to hear that! I was a subscriber of Crochet today in the past but didn't know they were closing it down. 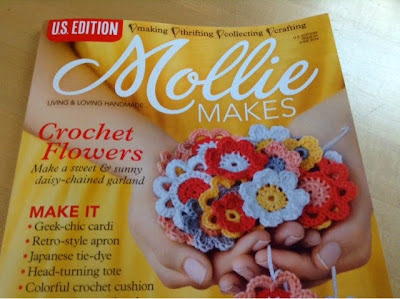 As a matter of fact, the publishing house that publishes Mollie Makes also publishes the Simply Crochet - a mag I am in love with right now. Ohhhh I know the feeling! Molly Makes is a wonderful magazine too! I didn't know the end of this magazine was coming.Now I wish I had subscribed and had more of the old issues.Enjoy the copies you have! I felt the same way when Coldwater Creek announced that it was going out of business. What a shame! Sometimes I wish things would stay the way they are. I guess I don't take to change very well. I've heard of Mollie Makes magazine and I've heard good things about it. Hopefully it will grow on you. So many magazines are going under. I hate that. Glad they gave you another option even though it doesn't replace your favorite. © Julie's Creative Lifestyle: New Magazine Change!